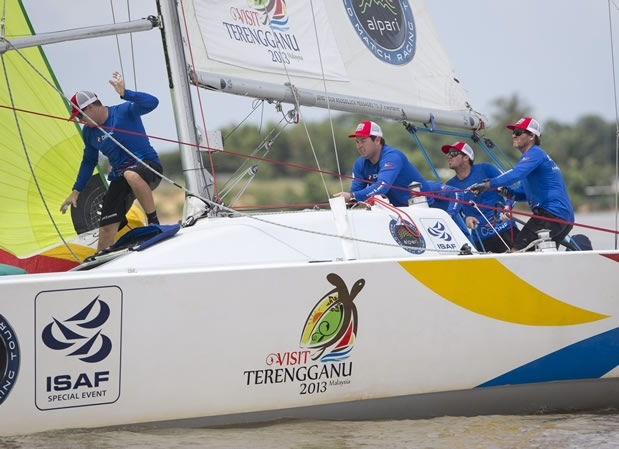 The first big deluge struck the Monsoon Cup in Malaysia today, but Taylor Canfield shrugged off the hard rain to come through as top Qualifier in the concluding event of the Alpari World Match Racing Tour. It wasn’t a perfect day for the talented 24-year-old from the US Virgin Islands however, as he lost a critical match to arch rival Ian Williams. The four-time World Champion from Great Britain managed to win a penalty against Canfield’s USone team in a luffing match on the first beat of their race, and the GAC Pindar crew went on to secure victory in the light and fluky conditions. If Williams could go on to win his remaining matches, he would topple Canfield from the top of the Qualifying leaderboard and get first pick of his opponent in the Knockout Rounds. But then the defending World Champion fell to Bjorn Hansen, and the opportunity was lost. Canfield was confirmed as winner of Qualifying, even with two of the 17 flights still to be completed tomorrow. Tomorrow the final two flights of Qualifying will conclude before the top eight go through to compete in the Quarter-Finals.